Stimulate Passion. We craft the ultimate in hospitality with a focus on detail and individualized attention, resulting in an unrivaled experience that excites the senses. Foster Creativity. We provide a luxurious canvas and all the elements required to create a masterpiece. We then deliver unparalleled event hosting service to bring your concept vividly to life. Trigger emotion. Your event creates precious memories while helping preserve the memories of those struggling with brain health. Proceeds support Keep Memory Alive, a 501(c) 3 organization, in their mission to provide enhanced treatments, and ultimately a cure, for brain disorders. Inspire Thought. Our Keep Memory Alive Fine Art Program brings the works of famed artists into the community, encouraging cultural appreciation and creativity. Art fosters brain development, especially of the creative and intuitive right brain functions. We are honored to currently feature a James Reinquest piece, commissioned by Steve Wynn and valued at approximately $3 million dollars, adorning our Event Center wall. For those artworks available for sale, proceeds benefit both the artist and Keep Memory Alive in support of Cleveland Clinic Lou Ruvo Center for Brain Health. Initiate Conversation. Our venue brings people together in comfort and style to foster genuine connection and discussion. Promote Environmental Responsibility. Keep Memory Alive Event Center features green initiatives in the building, embracing an ecologically sustainable and mindful philosophy that understands we all have a part to play in promoting the health of our planet. 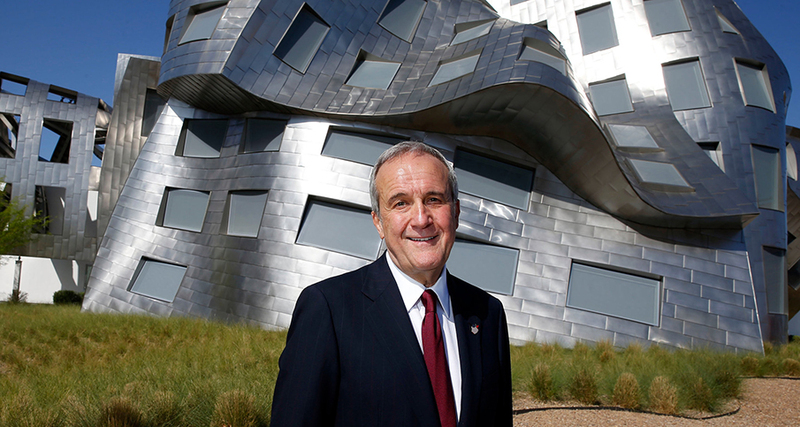 Philanthropist Larry Ruvo founded Keep Memory Alive (KMA) in 1996 to raise awareness, provide caregiver support, and raise funds for research brain disorders after his own father’s battle with Alzheimer’s disease. In 2006, Larry’s passion inspired renowned architect Frank Gehry to design a medical facility to treat neurocognitive disorders in Nevada. The building broke ground on February 9, 2007, was designed in Los Angeles, engineered in Germany, fabricated in China and built in Las Vegas. Construction was a massive, cross continental feat, and the center has become an iconic landmark in Downtown Las Vegas. In 2009, Larry partnered with Cleveland Clinic, perennially named among the nation’s top five hospitals by U.S. News and World Report, and the Cleveland Clinic Lou Ruvo Center for Brain Health was opened May 21, 2010. Today, there’s no denying that Frank Gehry’s design continually inspires employees, visitors and event guests who are impressed, intrigued, and sometimes speechless— but always engaged. People are eager to learn what the Cleveland Clinic Lou Ruvo Center for Brain Health is doing to advance diagnosis, care and treatment for these disorders. You can find out more about the innovative concept in medicine, featuring care, clinical trials, active family caregiver programs, and education programs for individuals and families who are living with brain disorders including Alzheimer’s, Huntington’s, Parkinson’s disease, frontotemporal dementia and multiple sclerosis here http://www.keepmemoryalive.org/.